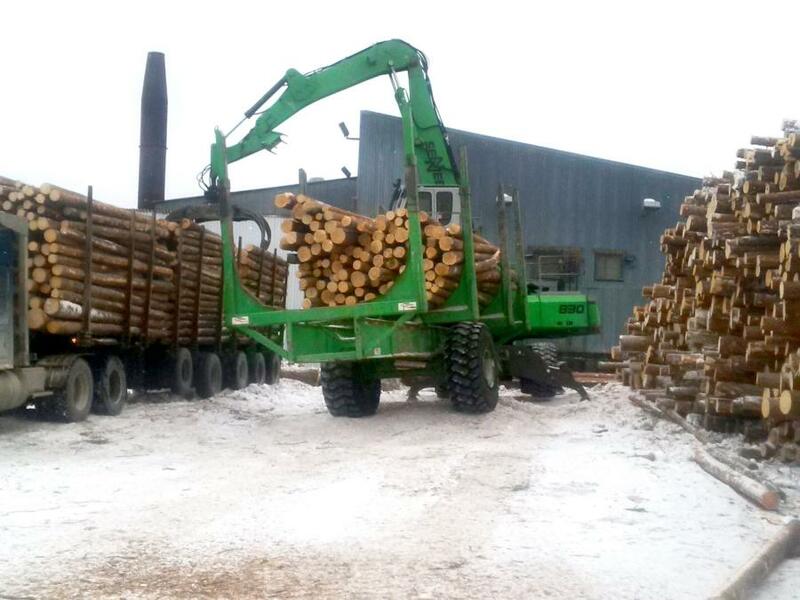 The re-opening of the sawmill in White River, Ontario, was one of the lumber industries rare “good news” stories of 2013. Shuttered six years earlier, the town's population had dwindled to nearly half its size from the 1990s. 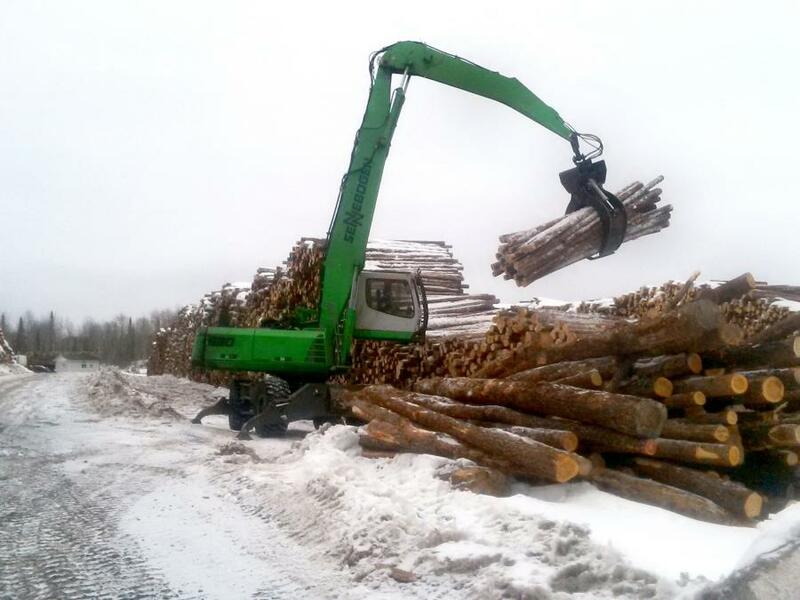 Then numbering about 600 residents, the Township of White River and the nearby Pic Mobert First Nation joined forces to create White River Forest Products LP (WRFP). Led by CEO Frank Dottori, the renowned founder of Canadian forestry giant Tembec, the new venture invested heavily in restoring the site and creating a new model of efficiency in Ontario's north. The centerpiece of the new mill is the new saw line and the infeed deck with the new debarker. Equipped with 14 scanners to achieve dramatic improvements in the mill's yield from every tree, the new saw line can out-produce all three of White River's previous lines put together. The next challenge was to match that efficiency in the yard's loading capability. For that task, WRFP has turned to Sennebogen 830 M-T purpose-built material handlers. In the meantime, the yard contracted out a loading by-the-hour service with Dan Bolduc of DKR Trucking. Bolduc was operating an 830 M-T, specially designed by Sennebogen to pull a large trailer. 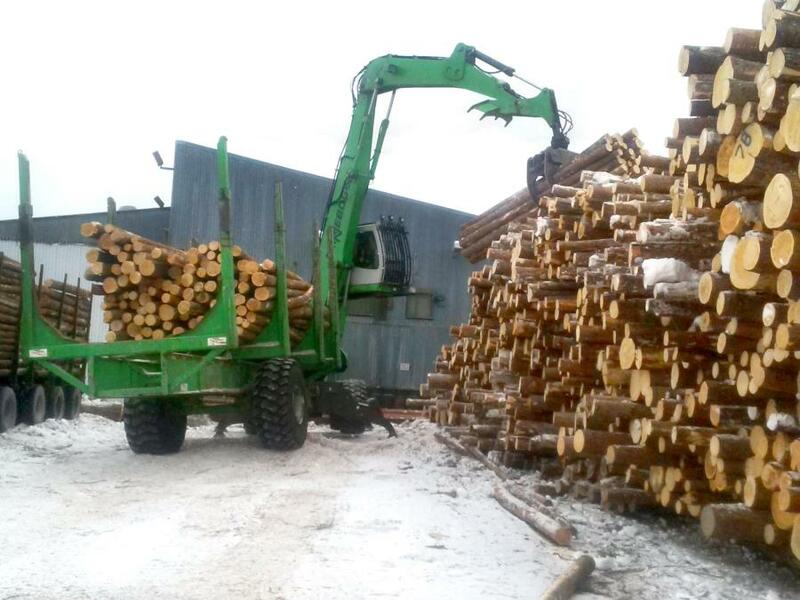 The 830 took on the yard's full range of loading duties: offloading trucks, stockpiling the wood, forwarding logs to the mill on a trailer and loading the infeed from the trailer. 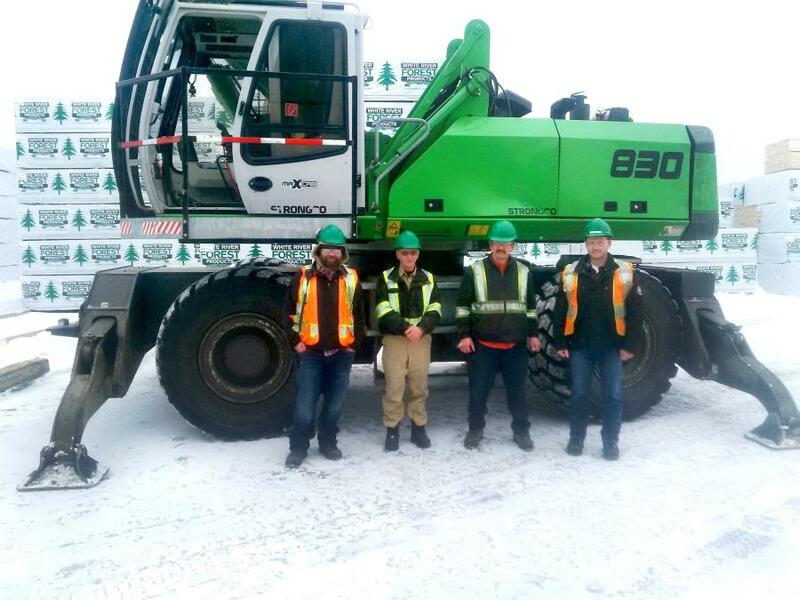 With a front row view of how Bolduc's machine did it all, Dottori and the WRFP board soon approved the purchase of another unit from Strongco, the Sennebogen distributor located in Sudbury, Ontario. Surviving the cold of White River winters is just one of the challenges to the SENNEBOGEN machines. Wicked freeze and thaw cycles in the spring leave the yard in a slippery, boggy condition: tough sledding when you're pulling a big load. Forwarding from the stockpiles to the deck can be a trip of up to 700 yards. The undercarriage's higher clearance is uniquely designed for the job, with dual transmissions to drive each axle and with a frame specially reinforced against pulling stresses. Sennebogen's elevating Maxcab provides operators with the visibility to keep the site safe while unloading and stacking. The cab's sliding door and catwalk allows safe entry and exit, especially when the yard is filled with snow and ice. With the upgraded saw line, White River can produce up to 40,000 board feet per hour. Processing black spruce and jack pine logs from 4 in. to 20 in. in diameter, its chip volume has been reduced by half. The mill now yields more lumber from each tree. At full capacity, it targets 150 million board feet of FSC-certified products, with about 70 percent in 16 ft. lengths of 2 X 4 and 2 X 6. The return of the mill has led to a rapid resurgence of the town. With 160 employees at the mill, White River is seeing the return of experienced workers like Robert Acs. The town's population has risen again to more than 1,000, and its most pressing problem these days is housing its new residents. With the 830 M-Ts in the yard, Acs is keeping up with the saw line. The mill is keeping up with today's most advanced technology. And now, happily, the town is working to keep up with the mill! For more information on the full line of Sennebogen green line material handlers, visit the website at www.sennebogen-na.com.